Aggression, like snapping or growling at a perceived threat, is a serious issue. If you are seeing these signs in your dog, it’s important for you to take steps right away and curb these behaviors before they get worse. If you are looking to train an aggressive dog, then this article is for you. Dogs can be aggressive towards people and even other dogs. Sometimes dogs are aggressive because of some other type of trigger, like a neighborhood cat that sneaks through the back yard. It’s up to you to figure out what your dog’s aggressive behavior is being triggered by and do what you can to stop the behavior or redirect it. In many cases, a dog isn’t exhibiting aggressive behavior because he was just born aggressive, he is exhibiting such behavior because his owner may not have properly trained him or perhaps didn’t know how to train him. Dogs are instinctual creatures and will respond to situations based on their intuition, especially if they have never been properly trained and taught something different. Unfortunately, even doing something simple like going for a walk can be highly stressful if your dog has not been properly trained and is exhibiting aggressive behavior. Worse of all, your dog can even hurt himself, another animal, or even you if he has been triggered to lash out. That’s why it is imperative that you change these behaviors as soon as possible. In other cases, aggression stems from poor socialization when the dog was just a puppy. Dogs must be properly socialized when they are young to be exposed to different environments and people. A dog who has been properly socialized will not feel threatened when something or someone new comes into their environment. He will be used to those things and will know how to respond (or not respond to them). If you stop to think about it, dogs haven’t always been domesticated creatures. Wild dogs had to be aggressive in order to hunt for food and defend themselves and their territory. But that aggression is an unwelcome residual instinct that can be a big problem in domesticated dogs. Aggression left unchecked can worsen and endanger family and others around you. Always take aggression seriously and if necessary, enlist the help of a good dog trainer to teach your canine proper behavior. Aggression can be apparent in dogs of all ages, from a poorly socialized puppy to a poorly socialized adult. Often, aggression will manifest itself more as a warning signal from a dog in the direction of the perceived threat, but sometimes it can progress and become an attack, which can cause harm to both your dog and the victim. Growling and/or baring his teeth. Displaying rigid or still posture. He looks stiff and tense. His tail and head may be up, and he may stare. You may notice the hair on his back and neck rise and stand on end. Snarling deep in his throat. This is similar to a growl, but he won’t bare his teeth. He might bark in a threatening manner. He may posture, lunge, or charge at his target, and wag his tail in a frantic manner. An aggressive dog may mouth or bite lightly. Some may snap or nip, but it won’t leave a mark. Other dogs might actually bite and cause a wound, either punctures or bruising. Some dogs bite a victim multiple times in quick succession or bite and shake, causing real damage and injury. There are multiple causes of aggression in dogs. Some breeds may be naturally more aggressive than others. Personality also plays a role. Environment also plays a large factor, especially if the dog comes from a place of neglect or downright abuse. Just like people, dogs can experience triggers after a trauma and behave with aggression as a way to protect themselves. To dogs, this behavior is a defense mechanism closely related to fear. A dog that is fearful might get aggressive if he feels trapped and he sees it as his only option. Sometimes a dog can have a fearful nature and be higher strung than another dog, which can create aggression. Defensive aggression may stem from fear of something, but instead of just reacting, a dog might go on the offensive, especially if he feels he needs to defend himself. Dogs that are not socialized well as puppies will often behave in an aggressive manner. Some dogs tend to be protective and territorial which can lead to aggressive behaviors. A dog is almost hardwired to protect his territory and defend his pack, including his humans and his homestead. Some dogs can become dominant and possessive, leading them to behave with aggression if their possessions are threatened, such as his food bowl or a favorite toy. There are other types of aggression as well, like redirected aggression, which is what happens when someone interferes with a dog’s aggressive behavior, as well as aggression related to male sexuality, predatory aggression like chasing a small animal that runs past your canine, and pain-related aggression that occurs when a dog is in pain and lashes out. Remember that dogs evolved from the wild. Even though many dogs today are highly domesticated, there will often be residual pack mentality instincts that drive them. The first thing you have to do is to figure out what is triggering your dog’s aggression. It could be someone or something specific, like a friend or neighbor or another animal that comes into your dog’s territory on a regular basis. It could be something less specific. Maybe your dog responds poorly to having strangers near no matter who they are. Once you have identified the things that set your dog off, you can begin taking steps to recondition your dog to respond better when he is exposed to these triggers. Tactics like classical conditioning and operant conditioning are often used to help a canine learn to associate positive things with certain people or places, as well as associate positive things with his own actions. By using both types of conditioning, you can try to make lasting changes to the root causes of your dog’s behavior, not just the outward manifestations of his aggression. It used to be thought that punishment was appropriate to help retrain a dog with aggression, but it doesn’t. It can actually make the problem of aggression worse because your dog will learn that every time he is around something or someone that brings out his aggression, proximity earns him punishment from you. This can create its own cycle of negative effects and be counter-intuitive to your efforts to stop your dog’s behavior. The best thing to do if you’re dealing with this situation is to consult with a professional dog trainer. You can try training him yourself, but if you don’t have a lot of experience, it may be wiser to have a professional by your side at least to get you started. They can help you figure out the root cause of your dog’s triggers, help you develop a plan, and show you some training methods to bring your dog under control. 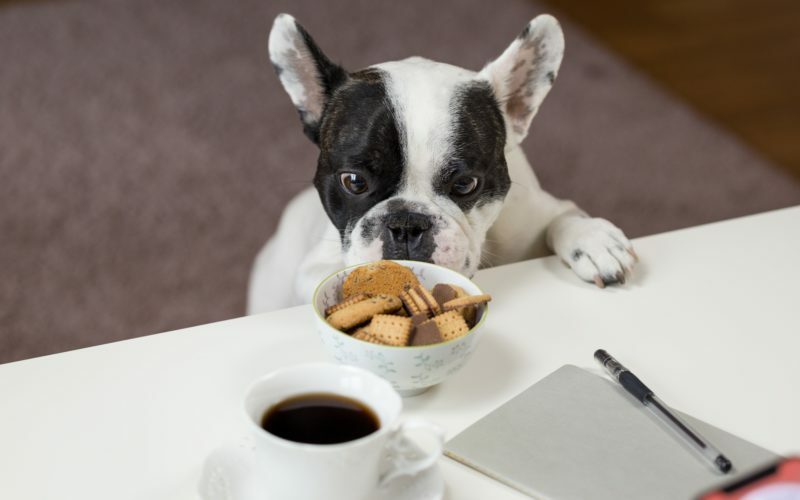 One of the first things a trainer will do is begin to implement something called “No Free Lunch.” This is a strategy designed to teach your dog that all good things, like playtime, walks, treats, toys, anything that makes your dog happy, come from you and he only gets them when he is obedient to your cues. You should also positively reward your dog for all behavior that isn’t aggressive. Much like a child, acknowledging when they are behaving well, dogs respond to positive reinforcement. Your pet will realize that their actions lead to a desired response from you, whether that’s petting and praising him, giving him a treat, going on a walk, or any other enjoyable activity. A trainer can help you map out a program to train your dog using different strategies like shaping, counter-conditioning, desensitization, and more. It’s important to note that you should avoid punishing your dog for aggressive behavior. It rarely has the desired effect and can even make your dog’s aggression worse. Another important step in training an aggressive dog is to have complete control over his environment. Putting your dog in a situation that you already know causes him stress and brings out his aggression is setting him up to fail. If you can’t avoid people or certain situations, make sure your dog is still supervised and controlled by you. That means he needs to be on a leash at all times and if necessary, wear a muzzle when he is around other people or animals. Don’t allow your dog outside to bark and behave aggressively either. Every chance your dog gets to behave in an aggressive manner only reinforces those undesired tendencies and makes him think they are acceptable. If your dog has too much freedom without constant positive reinforcement and feedback on correcting undesirable behaviors, he will continue to display those actions and develop poor habits. Dogs are much like children in many ways. They thrive on structure, boundaries, and clear expectations. All of those things help your dog to feel safe and secure, which is important for discouraging aggression. Making sure your dog gets plenty of exercise can also be beneficial, not just for your dog’s physical health but for his mental health and aggressive behaviors too. Again, like with people, exercise can be a stress relief and help your dog cope with his feelings of aggression. Other tips to keep front of mind as you train an aggressive dog or work with a trainer, is to always use two leashes when walking the dog outside, as a failsafe in case something happens, and your dog breaks away from the main leash. Teaching your dog hand signals is also helpful in keeping them under control. Some owners may want to teach their aggressive dog a safety word to use when outdoors. It’s essentially a command for the dog to come to you but using a different word than come. It should be a word that you wouldn’t use normally use, and only be used during situations that could potentially cause violence. One last thing to keep in mind is to never ignore aggression in your dog. This can be dangerous both to you and even more so, to others. Your dog should view you as the pack leader. When he does, because of that, his instinct will be to keep you safe from perceived threats. It’s up to you to teach your dog, patiently and consistently, which behaviors are acceptable, and which are not. Learning how to train an aggressive dog will take time and success won’t happen overnight. Continue to be patient and consistent with your canine and show him lots of love and positive reinforcement. Eventually, you should begin to see a marked improvement in your dog’s aggression. “4 Steps to Train an Aggressive Dog.” PetHelpful, 23 Jan. 2018, pethelpful.com/dogs/train-aggressive-dog-with-safety-word. Bender, Amy. “How to Stop Aggressive Behavior in Dogs.” The Spruce Pets, 24 Jan. 2019, www.thesprucepets.com/dogs-and-aggression-1118229. Burwell, Jim. “Aggressive Dog: What Steps Do I Take to Make My Dog Better?” Jim Burwell’s Petiquette, 30 Mar. 2013, www.petiquettedog.com/aggressive-dog-steps-dog/. Hebert, Beverly. “Aggressive Dog Training and Socialization.” Whole Dog Journal, 1 Dec. 2001, www.whole-dog-journal.com/issues/4_12/features/Teaching-an-Aggressive-Dog-to-Socialize_5417-1.html.